Two-thirds of online adults have a profile on a social networking site, and most restrict access to friends only. A notable portion of those who already restrict access to their SNS profile take further steps to limit what certain friends can see. Some 26% of those whose profile is at least partially private say they use additional privacy settings to limit what certain friends can and cannot see. This finding is consistent across all core demographic groups. 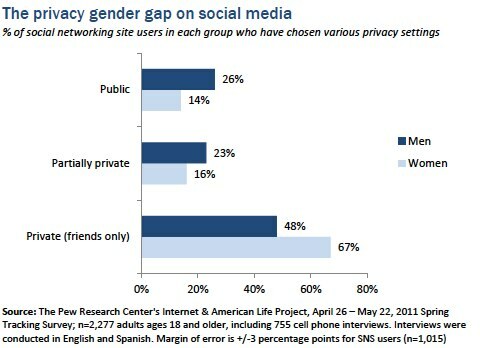 Women who maintain social media profiles are significantly more likely than men to keep their profiles private. However, there is a significant gender gap when it comes to the way male and female social media users choose to manage their profiles. Women are much more conservative in the basic settings they choose; 67% of female profile owners restrict access to friends only compared with 48% of male profile owners. Likewise, men are more apt than women to choose partially private (23% vs. 16%) or fully public (26% vs. 14%) settings. 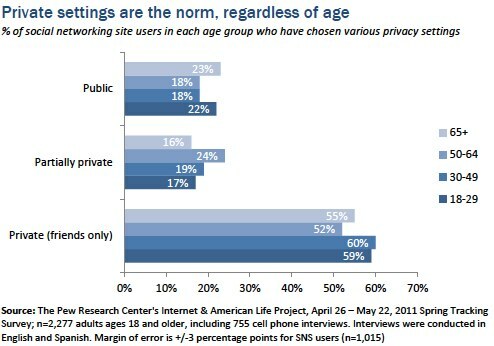 Young and old alike choose private settings for their profiles. The choices that adults make regarding their privacy settings are also virtually identical to those of teenage social media users.7 Close to two-thirds (62%) of teens who have a social media profile say the profile they use most often is set to be private so that only their friends can see the content they post.8 One in five (19%) say their profile is partially private so that friends of friends or their networks can see some version of their profile. Just 17% say their profile is set to public so that everyone can see it. 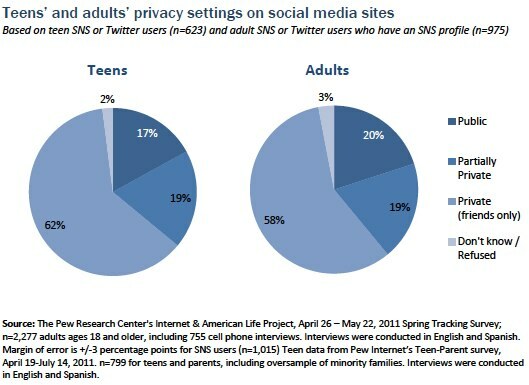 This distribution is consistent regardless of how often a teen uses social network sites. The complexity of privacy settings varies greatly across different social media sites, and in the case of Facebook, the default settings have changed significantly over time.9 In all, 48% of social media users report some level of difficulty in managing the privacy controls on their profile, while 49% say that it is “not difficult at all.” Few users (2%) describe their experiences as “very difficult,” while 16% say they are “somewhat difficult” and another 30% say the controls are “not too difficult” to manage. Young adults are considerably more likely than any other age group to feel fully confident in their privacy controls; 57% of social media users ages 18-29 say it is “not difficult at all” to manage them, compared with 48% of those ages 30-49, 41% of those ages 50-64 and 31% of those ages 65 and older. Social media users with the highest levels of education report the most difficulty in managing the privacy controls on their profiles. Profile “pruning” is on the rise. Deleting unwanted friends, comments and photo tags grows in popularity. Over time, as social networking sites have become a mainstream communications channel in everyday life, profile owners have become more active managers of their profiles and the content that is posted by others in their networks. Two-thirds of profile owners (63%) have deleted people from their networks or friend lists, up from 56% in 2009. Another 44% say they have deleted comments that others have made on their profile, up from just 36% two years prior. And as photo tagging has become more automated on sites like Facebook, users have become more likely to remove their names from photos that were tagged to identify them; 37% of profile owners have done this, up from 30% in 2009. Women and young adults are the unfriend-liest. Female social media users are more apt than male users to cull their list of friends and delete any unwanted contacts: 67% of women who maintain a profile say they have deleted people from their network, compared with just 58% of men. Likewise, young adults are more active unfrienders when compared with older users. Seven in ten (71%) young adult social media users say they have deleted contacts from their friends list, compared with 63% of users ages 30-49, 56% of those ages 50-64 and only 41% of those ages 65 and older. Deleting social media comments is part of the reputation management work of being a young adult. All users have become more likely to delete comments on their profiles over time, but this is especially true of young adults. 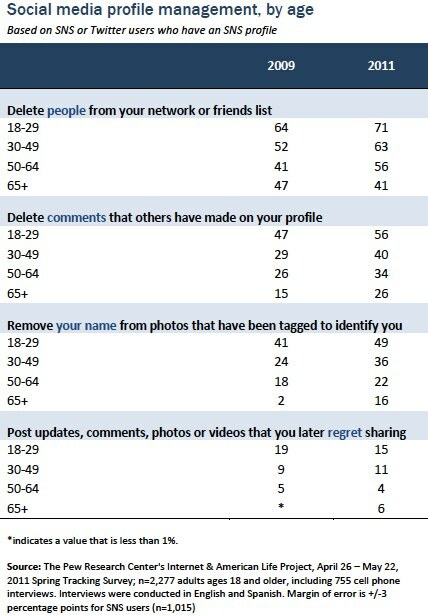 It is now the case that 56% of social media users ages 18-29 say they have deleted comments that others have made on their profile, compared with 40% of those ages 30-49, 34% of those ages 50-64 and 26% of social media users ages 65 and older. In contrast to the gender differences with unfriending, male and female social media users are equally as likely to say that they have deleted comments that others have made on their profile (44% of men and women report this). The task of removing photo tags is also much more common among young adults. Whether because there are simply more photos being shared or there is more sensitivity to their content, young adult social media users are the most likely age group to report removal of photo tags. Fully half of young adult social media users (49%) say they have deleted their name from photos that were tagged to identify them. That compares to 36% of social media users ages 30-49, 22% of those ages 50-64 and only 16% of those ages 65 and older. As with comments, there are no significant gender differences; male and female users are equally likely to delete photo tags (36% vs. 38%). While users manage the content that others post, one in ten profile owners voices regrets about their own posts. Even as social media users become more active curators of their profile, a small group of what might be described as trigger-happy users say they post updates, comments, photos or videos that they later regret sharing. One in ten profile owners (11%) say they have posted regrettable content to a social networking site, virtually the same number as reported this activity in 2009 (12%). Male profile owners are almost twice as likely as female profile owners to profess regret for posting content (15% vs. 8%). Young adults are also considerably more prone to regret; 15% of profile owners ages 18-29 say they have posted content they later regret, compared with just 5% of profile owners ages 50 and older. Most social networking users are on Facebook and manage their social media presence through one account. More than nine in ten (93%) profile owners say that they have a profile on Facebook, up from 73% in 2009. Over the same period, the popularity of MySpace has continued to wane; 48% maintained a presence there in 2009, while just 23% of profile owners said they used MySpace in the latest survey. At the same time, use of Twitter has grown almost twofold, such that 11% of profile owners say they have a presence there, up from just 6% in 2009. Whether due to the influx of new social media users in recent years or to those who are simplifying their online identity management, users have become more likely to maintain a profile on just one site. More than half (55%) of social networking and Twitter users say this, up from 45% in 2009.